This week I am showing you what’s blooming in my garden at the moment. I am joining Carol, from May Dreams Gardens. Why don’t you join in and show us what’s blooming in your garden? 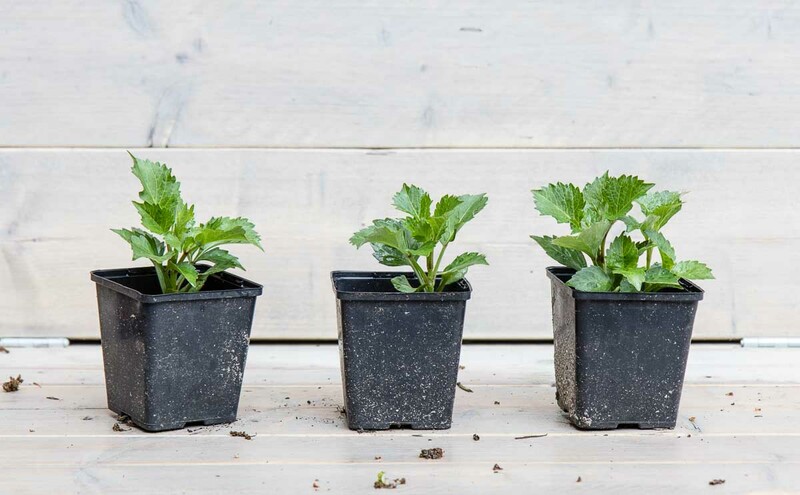 Please leave a comment to tell us about your garden. Just click on a name in the comments if you want to visit other blogs. My front garden is full of bluebells, or wood hyacinths. They grow in many gardens in the neighbourhood, and also along the roadside. These are not the wild bluebells that cover forests in Belgium and England and attract thousands of visitors each year. A woodland carpet of Bluebells must be a wonderful sight, I have seen the pictures. I would love to visit one of these fairytale forests myself one day! It is likely that there are no more wild bluebells in the Netherlands. The bluebells found in the wild and in gardens in the Netherlands are a cross between the native bluebells and the Spanish bluebells. 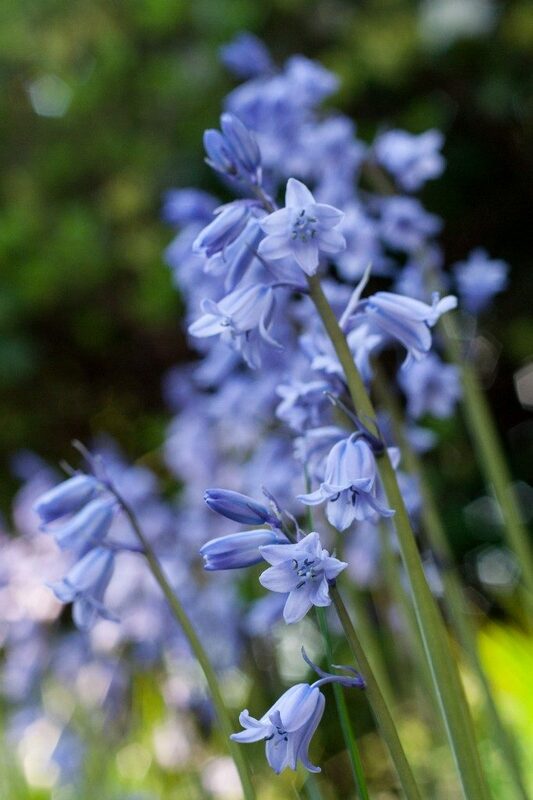 There are many good articles explaining the difference between wild bluebells, Spanish bluebells, and hybrid bluebells. Wild bluebells have a sweet scent, Spanish bluebells have pink and white flowers too. Some bluebells in my garden look like Spanish bluebells, some look like the wild bluebell. Even though they are hybrids, I am happy with my own little bluebell patch. 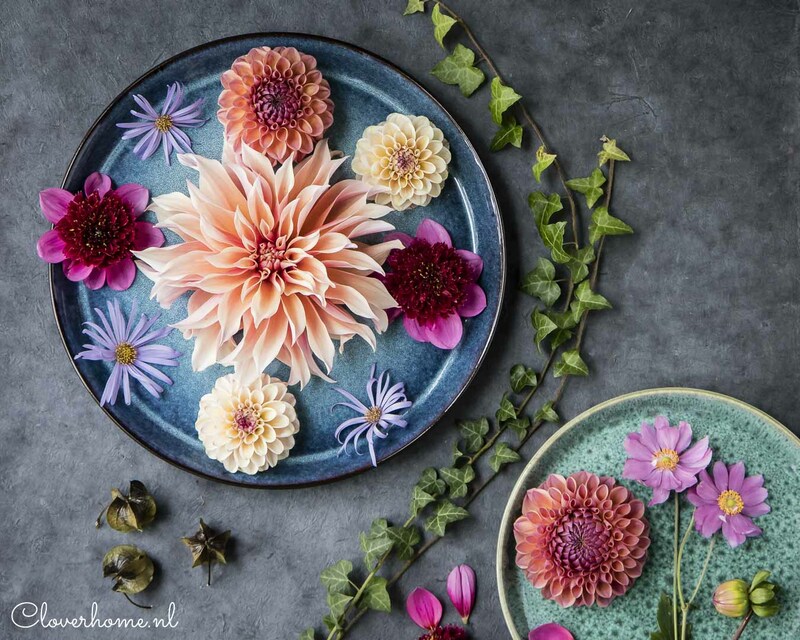 Do you remember my Summer bouquets: Mix and match? I was so in love with the clematis in the purple flower arrangement I decided to buy the exact same one for my garden. 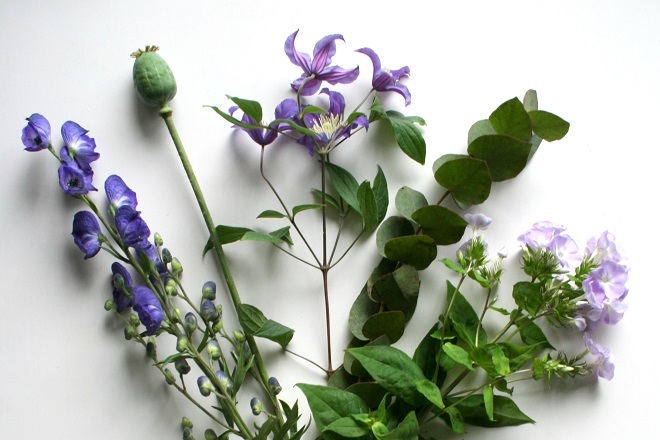 The beautiful purple clematis is called Blue Pirouette. 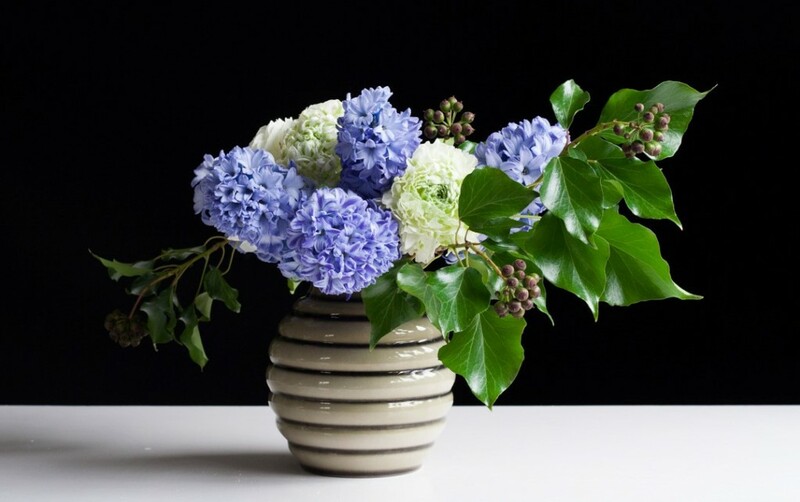 According to the breeder, it has a long bloom time, strong stems and exceptional vase life. I bought two of them and planted them underneath one of our old oak trees. I also bought a dark pink clematis of the same series. I planted them last year October but the first leaves are just appearing above ground. They should start to bloom in June, I can’t wait! Luckily I have another clematis in flower at the moment, Clematis Montana ‘Rubens’. This is a very common clematis, maybe you have it in your garden as well. It’s an early flowering clematis. 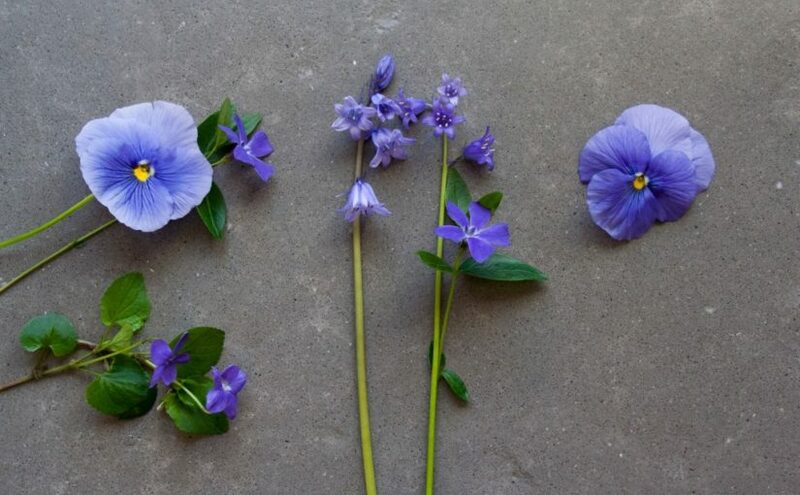 Did you know there are varieties flowering in spring, summer, autumn and winter? This vigorous clematis produces sweetly scented pale pink blooms in May and June. The flower has a light green and yellow heart, the leaves are bronze-green. Perfect for a wild and loose flower arrangement! We have poor sandy soil but my garden is still looking healthy. Rhododendrons thrive in this environment and many of our neighbours grow them as hedges. The tall shrubs create a mass of flowers in spring. It’s an impressive sight. I have even seen tourists take pictures of each other in front of the rhododendrons down the road. We have several rhododendrons and azaleas in the garden. 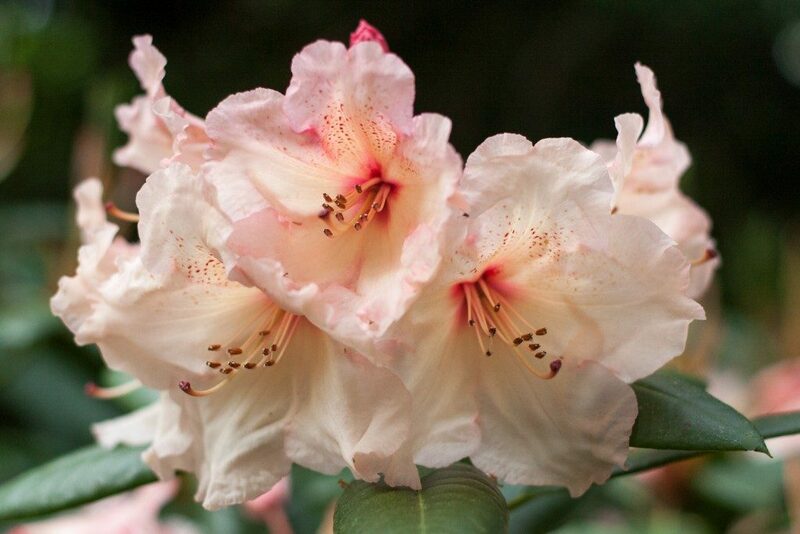 Azaleas and rhododendrons are related. 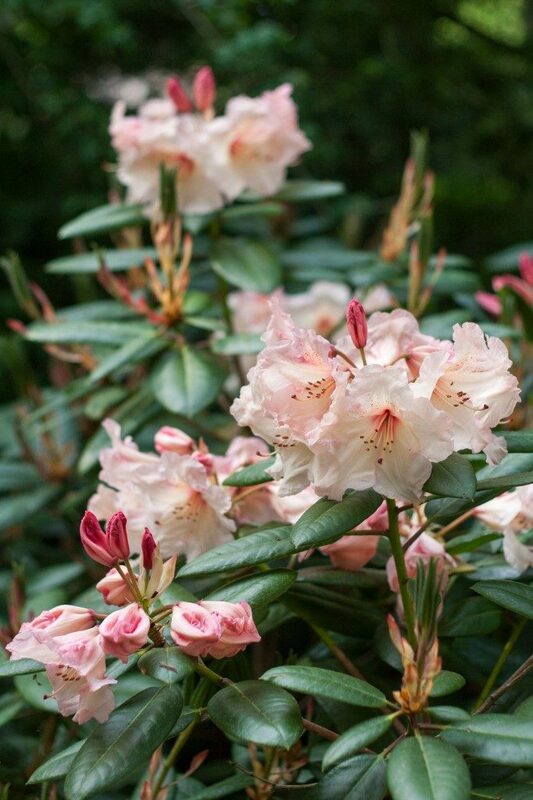 All azaleas are Rhododendrons (as in the genus), but not all Rhododendrons are azaleas. Rhododendrons are larger and have larger leaves. I think I love my rhododendrons more because of their dark green glossy leaves. They are also low maintenance, so they make the ideal shrub for my garden. You should remove spent flowers, but it’s impossible to reach all the flowers. They still do great! At the moment, two of our rhododendrons are in bloom. A small shrub with large pink flowers and a large shrub with lots of white flowers. I hope you enjoyed this month’s look at the garden. What’s blooming in your garden? Please share it with us in the comments below, or use the share buttons to share this blog post. Wij zijn op de camping en genieten ook volop van de bloeiende rododendrons. Maar op onze fietstocht ook bloemen geplukt o.a. 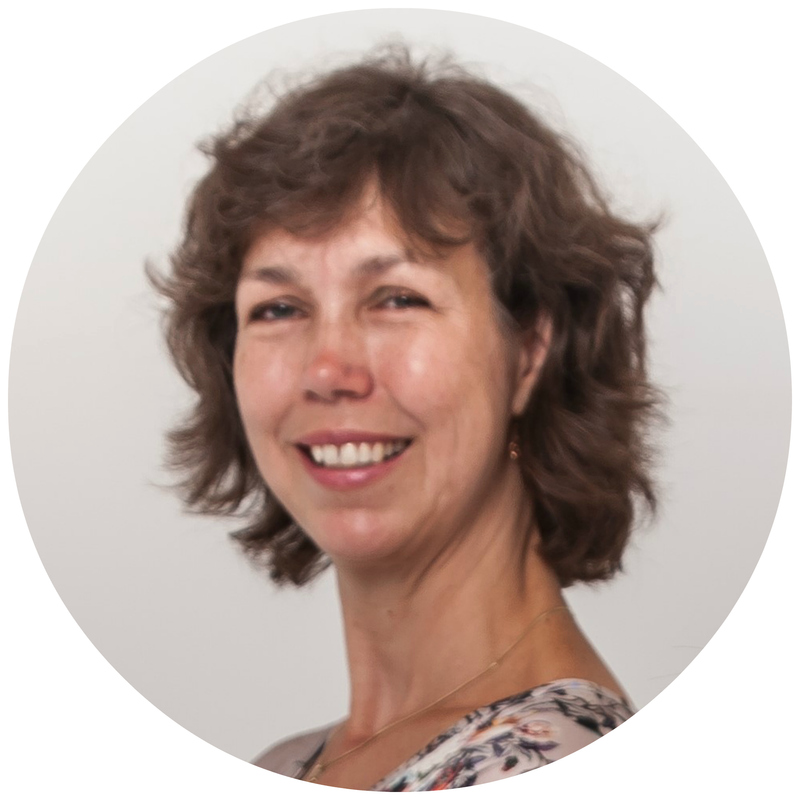 Koekoeksbloem, Look zonder look, Fluitenkruid en de Kaapse vergeet-me-niet. Ben benieuwd hoe het in mijn eigen tuin nu is. Dat zie ik snel weer. Ik vind dit ook een hele mooie kleur, een beetje zalmroze. De mooiste in mijn tuin. Maar er zijn zoveel mooie rhododendrons! Heerlijk om straks weer in je eigen tuin aan de slag te kunnen. Succes! Yes, the hyacinthoides poses a difficult question: the Spanish interlopers are not unattractive. 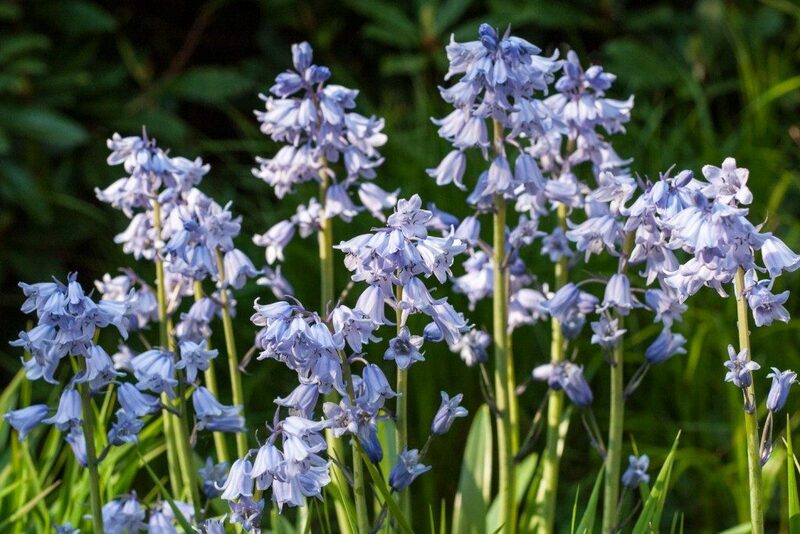 In fact, I rather like them, apart from their strong genes which makes them wipe out our native bluebells. We have masses of the English ones still in our local woods and I make a point of visiting them every year, especially if they grow en-masse under ancient beech trees. Our visit this Spring was a bit problematic, as the heavy rains had turned the ground into a guagmire and I wasn’t wearing suitable footwear. But I have never seen a native bluebell, so it’s difficult to compare the two. I like your flowers and your pictures! Good luck with your competition, and happy Bloom day! Thank you, Renee! Happy bloom day to you too. Hi Pauline. Beautiful pics. I think I voted?? I clicked the thumbs up icon? Brushing up on my dutch. he he. 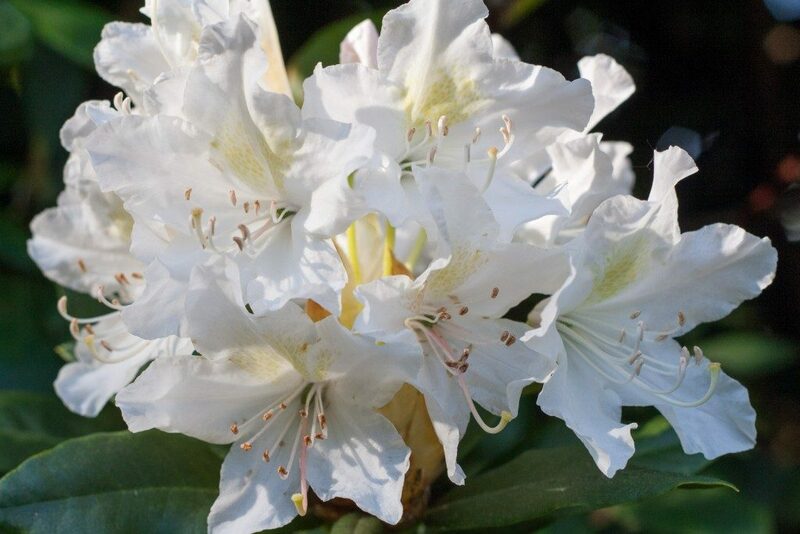 Your May sounds similar to our October here….A great time of year for flowers…Azaleas are tricky to grow here..They are picky with their soil choice and dont like our summers too much. I still have a go though in the shady parts of the garden.